In this statement Poe has given us the two distinguishing characteristics of all true short stories which set them apart in a class by themselves as a distinct literary type— brevity and the necessary coherence which gives the effect of totality. The ordinary novel is objectionable from its length, for reasons already stated in substance. As it cannot be read at one sitting, it deprives itself, of course, of the immense force derivable from totality. Worldly interests intervening during the pauses of perusal modify, annul, or contract, in a greater or less degree, the impressions of the book. But simply cessation in reading would of itself be sufficient to destroy the true unity. In the brief tale, however, the author is enabled to carry out the fullness of his intention, be it what it may. During the hour of perusal the soul of the reader is at the writer's control. There are no external or extrinsic influences—resulting from weariness or interruption. In this statement Poe has given us the two distinguishing characteristics of all true short stories which set them apart in a class by themselves as a distinct literary type— brevity and the necessary coherence which gives the effect of totality. The only limitation upon the development of the type which can be established beyond question is the physical inability or unwillingness of the average reader or listener to keep his mind on any one topic for any great length of time. The limits to human patience are not very different today from what they were before the flood. A man will listen just so long to a story or read just so many pages and then the spell is broken; his mind demands a change of diet, and the effect of the story is lost. Every extraneous statement, every unnecessary word, must be eliminated in order to bring the tale within the bounds of patience. And any tale which fails to meet these fundamental requirements of brevity and coherence is not a true short story. This negative statement eliminates a large mass of published matter from the field of our consideration and relieves us from the necessity of attempting to find a justification for that apparently inexcusable thing, an intended short story which is not short. Further than this, Poe's statement not only furnishes a negative basis for telling what a short story is not, but it also offers a positive foundation upon which we can establish a definition of the short story which declares that a short story is a brief tale which can be told or read at one sitting. This definition requires two things of the story: (1) that it shall be short and (2) that it shall possess coherence sufficient to hold the reader's or listener's unflagging interest from beginning to end. The terms of the definition are of necessity relative. It is, of course, impossible to draw a hard and fast line and say that any story which contains less than so many hundred words is short, while a tale which contains one word more than the allotted portion is long. The personal equation entering into the problem also renders it impossible to establish any fixed measure of the degree of coherence which is required to hold a reader's or listener's unflagging attention. The more we look into the matter the more evident it becomes that the limits and distinguishing characteristics of the short story as we know it today are the limits and distinguishing characteristics of the spoken story as it has existed from the beginning of time. It is frequently possible to read at one sitting a story which is not brief, but it would be a physical impossibility to tell at one sitting any story of this sort so as to hold the unbroken interest of a group of listeners. Human impatience insists that a spoken story shall be brief and to the point; and no better line of demarcation than this can be found to set off the literary type with which we are concerned from its brethren, the novel and the novelette. If we accept the test of brevity and coherence which this definition proposes, the only question which arises is as to its adequacy. Are brevity and coherence to be accepted as the sole distinguishing marks of a literary type? Or is it necessary to introduce some further limitations which will render our conception of the short story more concrete? Poe, in his criticism already quoted, maintained that in order to produce a true short story an author must not only make his tale short and to the point, but must also fashion it with deliberate care so that it will produce a single effect; and this statement has been accepted with more or less unquestioning faith by practically every man who has written authoritatively upon the short story since Poe's time. Brander Matthews [Philosophy of the Short Story] declares that "the short story is the single effect." Professor Bliss Perry [A Study of Prose Fiction, p. 304], while rejecting many of Mr. Matthews's conclusions, agrees with him that the short story of the nineteenth century is set off from those that preceded it by the "new attitude of the contemporary short-story writer toward his material, in his conscious effort to achieve under certain conditions a certain effect." Professor Canby [The Short Story in English, p. 233] says that "Poe succeeded in his work by fixing the attention upon the climax of his story, so that the reader sees, feels, thinks of the ' unique effect ' of the story and of nothing else. If the modern short story has a technique, here it is; if it is an invention, Poe invented it." It is only natural that the way in which these men make a fetish of "effect "should lead us to inquire whether, after all, this striving to produce a single foreseen impression is the only manner in which the coherence essential to a true short story can be secured! Even a casual consideration of the subject presents objections to the "effect "theory of the short story. If, as Professor Matthews declares, "the short story is the single effect," then most certainly such tales as The Scarlet Letter must be classed as short stories in violation of all of the canons of brevity; and if this cannot be done, the single effect definition will have to be modified. Dr. William J. Dawson [“The Modern Short Story” – North American Review 190:802] holds that the true short story treats "of one incident and only one," and Professor Matthews says that: "The short story fulfills the three false unities of the French classic drama: it shows one action, in one place, in one day." If these statements are accepted, ninety percent, of the tales that are commonly regarded as short stories will have to be put in some other class of literature. The question naturally arises, what are we going to do with Kipling's The Man Who Would Be King, which deals with four distinct episodes in as many different places, or with a story like Bjornson's The Father, which covers a whole lifetime? The answer which suggests itself is that instead of trying to make every sort of tale a separate literary type, it may be easier and more satisfactory to attempt to frame a comprehensive definition of the short story which by its nature will be inclusive instead of exclusive. Coming back for a moment to a consideration of the statement that the only way in which coherence in a short story can be secured is by striving to produce a single foreseen effect, it is altogether probable that even Professor Matthews would experience some difficulty in pointing out the single effect which Mr. Stockton aimed to produce with The Griffin and the Minor Canon, or which "Q "had in mind when he wrote John and the Ghosts. And the statement which applies to these tales of fancy would probably also hold true in a consideration of those tales whose sole purpose is to give a plain unvarnished statement of the facts in the case, without giving the slightest thought to any one particular effect which those facts may produce. In this class would come such narratives as the Biblical story of Joseph, Bjornson's stories of Norwegian peasant life, and most of Kipling's soldier stories. The best of these stories of fancy and fact are just as coherent as any tale ever told by Poe or de Maupassant with the idea of producing a single effect; and every one of them has just as much right to the name "short story "as is possessed by any other tale. The short story frequently deals with more than one incident, and does not by any means always produce a single foreseen effect. These facts would seem to lead to the conclusion that any attempt to limit the definition of a short story beyond the statement that it is "a brief tale which can be told or read at one sitting," is for our purposes inadvisable, if not impossible. The acceptance of this definition as it stands renders unnecessary any such efforts at classification as Mr. Matthews's rather futile attempt to distinguish between the "Short-story "(spelled with a hyphen and a capital S), "the story which is merely short," "the brief tale," and "the sketch" and leaves us free to include all short stories under one heading for study as a literary type. In the telling of a tale, what is not fact is fancy. Of course, the two classifications frequently overlap. Elements of fancy are found in fact narratives, while fanciful tales are constructed upon foundations of fact. It is possible, however, to throw all short stories into one group or the other in accordance with the element which makes up the substance of the story. Fact stories appear every day in the newspapers and in the narratives which make up the record of the historian. Stories of fancy have existed from the earliest time as one expression of man's desire to take himself occasionally far from the world of hard and inescapable facts. This classification brings us back to the basic truth in the child's division of his world into one part "really truly "and one part "let's pretend." After short stories have been grouped as stories of fact or stories of fancy, another classification suggests itself based upon the way in which the stories are told. A story of fact or a story of fancy may be told in any one of three ways—historically, dramatically or didactically. The same story may be told in three different ways. The man using the historical narrative method seeks primarily to convey the impression that here is the matter-of-fact story of things just as they happened. The man using the dramatic method seeks a single effect; while the didactic method involves as the chief consideration, the effort to teach a lesson. In the light of this classification it would appear that those who undertake to define the short story as "the single effect "are clearly striving to make a part greater than the whole. All of these men whose opinions on the short story we have been considering regard the short story as distinctly a nineteenth-century type of literature, as a literary form which was first successfully employed by Poe and his French contemporaries. As a matter of fact, even the briefest consideration of the history of literature should be sufficient to convince us that the short story, far from being a distinctive product of the nineteenth century, is the oldest form of literature, from which all other literary types, with the exception of the lyric and the critical essay, have developed in the course of time. Oral tradition begins with the first human family; and it is to this first oral tradition that we look for the genesis of the short story. Anthropologists assure us that primitive man was endowed with substantially the same imagination, pride in achievement, curiosity, and love of excitement and novelty which characterize the average man today. These are the attributes upon which the story-telling faculty depends; and hence we reach the conclusion that ever since human nature has been constituted as it is now men have been telling stories. Story-telling is as old as the day when men first gathered around a camp-fire or women huddled in a cave. The study of comparative folk-lore is teaching us every day how universal is the instinct for it. Even were we to leave out of view the literature of oral tradition, and take the earlier written literature of any European people—for instance, the tales told by Chaucer and some of his Italian models—we should find these modem characteristics of originality, ingenuity, and the rest in almost unrivaled perfection, and perhaps come to the conclusion of Chaucer himself, as he exclaims in whimsical despair, "There is no new thing that is not old." As far back as research carries us in the history of any people, we find a well-defined oral literature. Scholars of every nationality [Notably Grimm and Panl in Germany, Child in England, and Gautier and those who have supported and opposed his theories in France] in studying the epic and the ballad have traced for us the steps that mark the growth of the early national literatures. We find the great epics, the Chanson de Roland, the Nibelungenlied, Beowulf, the Odyssey, and the Iliad, developing from ballad cycles, centering about national heroes, which are shown to have rested upon lesser ballad groups dealing with separate achievements of these heroes, which, in their turn, can be, at least theoretically, split up into their component parts—single isolated ballads. With the processes of association, selection, and elimination by which the innumerable ballad groups and cycles which merged to form the epics were brought together, we are not concerned; but it will further the object of our inquiry to bear in mind the fact that the early ballads, which were merely short stories in rhythmical form, rested ultimately upon a basis of prose narrative—oral short stories. M. Leon Gautier, in the introduction to his monumental work on the French epics [Les Epopées Françaises, T. I., p. 3], accounts for the initial appearance of the lyric by declaring that the first emotions of the first man in the garden of Eden must have been such as could be expressed only in song; and in making this statement he is merely following a similar assertion found in Victor Hugo's preface to Cromwell. However, neither Gautier nor Hugo goes so far as to maintain that the progenitors of the human race continued to talk in lyrics after the novelty of their situation wore off; and it is an historical fact that the only conversations in Eden which have been recorded were carried on in prose. In our earliest histories we find that the art of telling stories had reached a point where the existence of fully developed cycles of spoken stories is taken as a matter of course. Tacitus refers to "the peculiar kind of verses current among the Germans, the recital of which they call barding." Einhard, in his life of Charlemagne, tells how the great emperor "had the old rude songs that celebrate the deeds and wars of the ancient kings written out for transmission to posterity." And in the old Anglo-Saxon poem of Widsith we find references to cycles of stories centering about Attila the Hun, Chlodovech the Frank, Theodoric the Ostrogoth, Rothari the Lombard, and Gunther the Burgundian. These cycles of stories spread all over western Europe, and the written literature of the twelfth and thirteenth centuries developed out of this spoken literature. This glimpse into the development of national literatures would seem to warrant the statement that while the epic is a national contribution to literature, and the ballad is a communal product, the short story, which in the last analysis proves to be the base of all our literature, excepting only the lyric and the critical essay, is distinctly an individual contribution. This theory of the development of an oral literature which makes the short story a primary unit does not rest entirely upon conjecture. Oral literature is to be found today wherever there is a more or less primitive state of race culture. In Hawaii, where even an alphabet was unknown until the arrival of the missionaries in 1820, a well-defined oral literature, rich in truly epic material, still survives, and it is possible to observe in that Territory at first hand the actual process of literary development suggested and outlined above. The same statement holds true in a degree of the Voodoo tales current among the Southern negroes, fragments of a great body of spoken stories brought from the African jungles. It is much easier to produce evidence to support a theory of the antiquity of the short story as a type than it is to unearth the connecting links to make complete the chain of evidence to prove that the short story as it is known today is not only the oldest of all literary types, but had also had a continuous existence from the very beginning of time to the present day in essentially the same form as we know it now. The difficulty of this latter task is due to the fact that until comparatively recent times the short story has been to a very large extent an oral genre, preserved as spoken and not written literature. The reasons for this are not hard to find. The output of ancient scribes and mediaeval printers was too limited to warrant the wasting of much of their time in the preservation of short stories, which everyone told and everyone knew. Such stories and ballads as were written, or at a later date printed, were as a rule valued so lightly by the scholars of the day that no serious effort was ever made to preserve them. In the case of the literatures of Western Europe, with which we are most familiar, the wide gap existing between written and spoken languages, taken together with the fact that only a very small portion of the population was at all familiar with the written language, tended, for centuries, to set the folk literature far apart from the literature of the scholars. The tales told in prose and verse by the people using the vulgar tongue were never considered as literature. When the dialects of the common people became national languages the number of stories written down was greatly increased; but still it was only very rarely that any effort was made to preserve collections of tales. The attitude toward folk literature that had been built up through so many centuries could not readily be changed. In this connection it is of more than ordinary interest to note the extent to which this popular conception of the short story as anything but literature moved Boccaccio, who thought so lightly of the Decameron that, although it was first given to the public in Florence in 1353, he did not submit it to Petrarch, his dearest literary friend, until after a lapse of nineteen years, in 1372 [cf. Boccaccio’s Decameron (Bohn). Notes by W. K. Kelly, pp. 541 ff.]. Practically no one could read, so that collections of stories, even in the popular tongue, were of little use. It was only occasionally, and then more often by a series of happy accidents than because of any recognition of merit, that the work of the masters of the short story was preserved. Nevertheless tales were told in those days just as they had been from the beginning and will be to the end; and we know that Boccaccio, Chaucer, and Rabelais, far from standing alone as exponents of their genre, were merely the master craftsmen in a host of story tellers. Even with our very imperfect knowledge of the periods when they lived and wrote, we are able to discover the works of long lists of forgotten lesser lights who preceded and came after them in the field of storytelling. 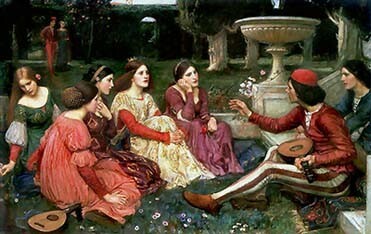 Modern students of the Decameron have succeeded in compiling a list of no less than twenty-eight collections of stories, the work of hundreds of authors—Greek, Latin, Oriental, Provencal, French, and Italian—from which much of the material for the immortal hundred tales was derived, while the list of immediate followers and imitators of Boccaccio is even more formidable than the array of his predecessors. These few early works which are still known to present-day scholars are, of course, but fragments of the great body of oral short stories which existed during the twenty centuries or more that they represent. The tremendous growth in the numbers of the reading public and the corresponding development of periodicals during the past two centuries, and particularly in the last one hundred years, has brought about the transformation of the short story from a spoken to a written type of literature. The great public, which was formerly satisfied to have its stories told to it, has become literate, and now reads for itself. However, the attitude of the scholars of the Middle Ages, who regarded the short story as an undignified excrescence upon the body of literature, unworthy of recognition or preservation, still persists in some quarters today. Having considered past and present conditions as they bear upon the general theory of the antiquity and continuous existence of the short story, it behooves us to examine the specific evidence which justifies the statement that the short story of the nineteenth century is in no essential way different from the tales which preceded it by a thousand years or more. The declaration is frequently made that Poe created a new literary type when he laid down his rules for the short story. But Poe's rules applied only to one class of short stories, those told to produce a single effect. Professor Matthews, Professor Perry, and their followers, in accepting Poe's dictum, have treated one class of short stories as if they constituted the whole body of short-story literature ; and, therefore, it is only necessary for us, in considering their declaration that the short story as we know it today is essentially a nineteenth-century product, to look up the antecedents of the tale that is told to produce a single effect. Is it possible that this one class of stories has developed so recently as to warrant the statement that it belongs exclusively to the nineteenth and twentieth centuries? If the search back to the beginnings of things, through the cycles of medieval tales to the ballads which have been preserved as the oldest fragments of the great body of prehistoric oral literature, reveals not merely one method of telling stories or two, but every type of the short story, we have reason to believe that every type of the short story was to be found even in the earliest tales of all, the prose narratives from which the ballads developed. There can be no question as to the antiquity of historical and didactic methods of storytelling, and the examples of "effect "stories in the most primitive literatures are numerous enough to warrant the conclusion that such tales have almost, if not quite, as ancient a lineage as the other forms of the short story. There is not a literature known to modern research which does not contain ghost stories told to produce a single effect. The intensely dramatic story upon which Burger founded his ballad of Lenore is found in the very earliest popular poetry of England, in different parts of Germany, in the Slavic countries, and in one form or another all over Western Europe. For compression, speed, and the skill with which a single effect is produced, this grim, primeval tale as it is told in the old ballads bears the same stamp of superlative excellence which is placed on the best product of Poe's pen. The old Germanic ballad of Tannh ä user, published in the Amim and Brentano collection of Volkslieder, is another example of the antiquity of the "effect "story. The coup de théâtre at the end of the story is just the sort of thing that we find in the work of the masters of the short story in the nineteenth century. Still another example of this same thing is to be found in the old English ballad of Lord Randall: and many pages would be required to give a complete list of the "effect "stories which might be selected from collections of English and German ballads alone, without any consideration of other literatures presenting the same features. In Boccaccio and his imitators and in the numerous collections of tales brought into Europe from the Orient we find all of the essential variations of the story told to produce a single effect, along with tales told in accordance with the other methods of narration. As the scope of the investigation becomes wider, it becomes more and more evident that as far back as it is possible to trace literary forms every type of the short story is to be found. The "effect "story has always persisted as a recognized mode of literary expression. When the development of periodicals and newspapers created a demand for the printed short story, this form made its appearance along with the others. Poe, Pushkin, and Merimee were all producing it at the same time; and the wide dissemination of Poe's dictum and of the rules of the successful French realists, through the newly established periodicals and other products of the constantly improving printing-press, led to the wave of over-emphasis of the "effect "story which is still with ns. The facts and theories which have been cited above would seem to offer a pretty solid basis for the conclusion that the short story as it is known in the nineteenth and twentieth centuries is not a new form of literature, but is rather the elementary literary type, whose essential characteristics have remained unchanged throughout all the ages. However, if the essentials of the short story are today what they were in the beginning, and if there is really nothing new or distinctive in striving to attain a given effect, the question arises, what is to be done with Professor Matthews's theory of the evolution of the short story, with Professor Perry's statement that the attitude of the modem story-teller toward his material is different from that of his forerunners, and with the numerous other authoritative utterances which treat the short story as a new literary type brought into being by Poe and his contemporaries early in the nineteenth century? What explanation is to be offered for the difference which exists between the stories which de Maupassant and Boccaccio told with the idea of producing a single effect, or between a story of horror as it is set forth in one of Poe's narratives and as it is told in an old ballad? In order to account for and explain this difference we must first determine what it is, wherein it is to be found. If the best stories of today are put side by side with those of four hundred or four thousand years ago, the old stories and the new ones not only fall together into the classes enumerated above, but also prove to be alike in methods of treating plot, setting, and characters, and are on a plane of absolute equality so far as unity of action, originality, and ingenuity are concerned. The fundamental characteristics of the best short stories today are the features that have characterized the best stories of all time. The only difference between modern short-story technique and that of the Middle Ages is a verbal one. The only development that can be traced is not an improvement in any distinctive essential of the art of story-telling, but is merely a general development in the knowledge of words and the ability to use them, which affects the framing of wills and the formulation of official documents much more vitally than it does the telling of tales. The average short-story writer today can be a better craftsman than the man who told tales a thousand years ago, solely because he has better tools of expression at his command. Extensive vocabularies are a product of the printing-press. The early short stories were told by men with comparatively few words at their command; and if the study of modern tales reveals in some instances a greater compression and a more realistic atmosphere than is to be found in the old stories, these things may be ascribed to the superior verbal equipment of the modern writer, which enables him to use exactly the right word in the right place, where his predecessor, piling up phrase upon phrase, could only approximate his meaning. Such development of the short story as there has been is due very largely to the development of the dictionary; and there would seem to be reason for holding that this narrow ground is the only one upon which any kind of an evolutionary study of the short story can be based. The final test of a theory of the sort set forth in the preceding pages, after all historical requirements have been met, is its application to present conditions. During the generation that has elapsed since 1870 five men have stood out above all others as masters of every form of the short story. These five men—Alphonse Daudet, Rudyard Kipling, Robert Louis Stevenson, Frank R. Stockton, and Sir Arthur Quiller-Coueh—have not attempted to restrict their genius to any one channel, but have written fact stories and tales of fancy, telling these stories historically, dramatically, or didactically with impartial and unfailing skill. These men have, of course, their distinctive traits, their individual strong points and weaknesses; but they are alike in their conception of the fundamental characteristics of the short story. The instinct for story-telling exists in substantially the same form in every race; all men recognize and insist upon the simple limitations of brevity and coherence; and hence, in this field of literature more than in any other, it is possible for an artist to produce masterpieces whose appeal, in spite of national lines and racial characteristics, is truly universal. The best short stories are not essentially French, English, Italian, or American, but are a part of the world's anthology.